For many in the DJ industry, finding the right headphones can be a complicated task. Most of us need a reliable pair that can handle a beating and still be ready for a live performance the next day. Of course one of the most common issues DJs come across is their headphones breaking. To help I’ve compiled this list, and also made sure they’re all closed-ear headphones to ensure you get the best results. Reason being, closed-ear headphones have a sealed-back, preventing noise from “bleeding” out of them. This experience allows you to hear the audio clearly while focusing on the song you’re cueing and better beat matching. So, now that you understand the benefits of these types of headphones, we can dive into which of them will best for you! 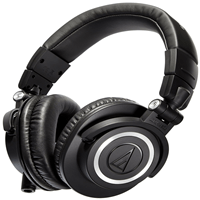 Audio-Technica ATH-M50X – Audio-Technica’s ATH-M50x is perfect for the DJ that spends a lot of time in the studio. The professional-grade sound and ultra comfortable build makes them easy on the ears, even after several hours of wear. 90-degree swivel points give you true comfort, regardless of how you wear them. Pioneer Pro DJ HDJ-2000MK2-K – Yet another sought after choice amongst both disc jockeys and audiophiles, this particular unit passes the most vital test for DJ phones with flying colors: it doesn’t distort at high volumes. The frequency range of the HDJ-2000MK2 is often unmatched, giving you the best of the highs and boom of the lows. The detachable headphone cable and rotatable ear cups give you some solid durability when you get a little carried away in the DJ booth. Go ahead, jump around! V-MODA Crossfade M-100- The ergonomic design with metal frame of the V-Moda Crossfade LP2 brings beautiful sound and elegant design together. The V-Moda family of headphones are unique. Optional shield kits also let you put a custom design on each earpiece, giving it a truly personal effect. 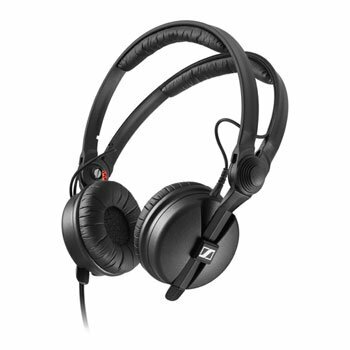 Sennheiser HD 25 – One of the most sought after gadgets on the market today, the Senn HD25 is the perfect device for DJing, thanks to its outstanding isolation and excellent quality of sound. It also has a fantastic amount of subs and bass, which is crucial to hear when mixing live. And although its design won’t win any prizes, the structure and build quality of this set is top notch. The same could be said about the level of comfort it offers the wearer. Simply put, this is a must-have headset if you’re serious about taking your DJ skills to the next level. 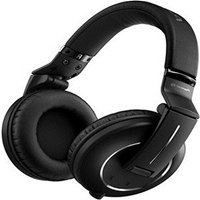 Beats Mixr – If you’re going for ultimate comfort and style, these are perfect for you. You can tell Apple made these for DJ’s because of their unique design. They’re extremely clean, symmetrical, and designed for perfection. In fact, the swivel feature is the best design feature in the game. It allows you to push it back easily behind the ear, then right back when you need it. Not to mention, the headband is flexible, giving the headphone great durability. So you don’t have to worry about them breaking when you take them off and hand them to another DJ. They also offer an enhanced low end for ultimate clarity at high volume, making these a great choice for professional DJ’s. Choosing a pair of DJ headphones is not a decision that can be taken lightly – you’re going to be making a valuable investment that you’ll most likely be using for a while, so it’s important you pick the right model. I hope you find this guide useful and informative, and use the tips I’ve shared with you to purchase a pair of top notch headphones that deliver a excellent performance and provides large value for your money.